Congratulations! You are now the proud owner of a Makerspace. If the links above don’t work , please try these alternate Dropbox Download Links: Makerspace Welcome Letter, Makerspace Starter Kit, MiniMaker Notebook. Directions: Please read the Makerspace Welcome Letter then download and print the Makerspace Starter Kit (pdf) and the Mini Maker Notebook. The Makerspace Starter Kit (pdf) should be folded with a hamburger fold then a second hamburger fold so the words in bold are on the outside. Folding instructions for the Mini Maker Notebook can be found at http://www.pocketmod.com/howto. Find out more about the Mini Maker Notebook here. Why a Makerspace Starter Kit? I have spent much of the last year spreading the word about makerspaces in workshops, webinars, Twitter conversations and on this blog. 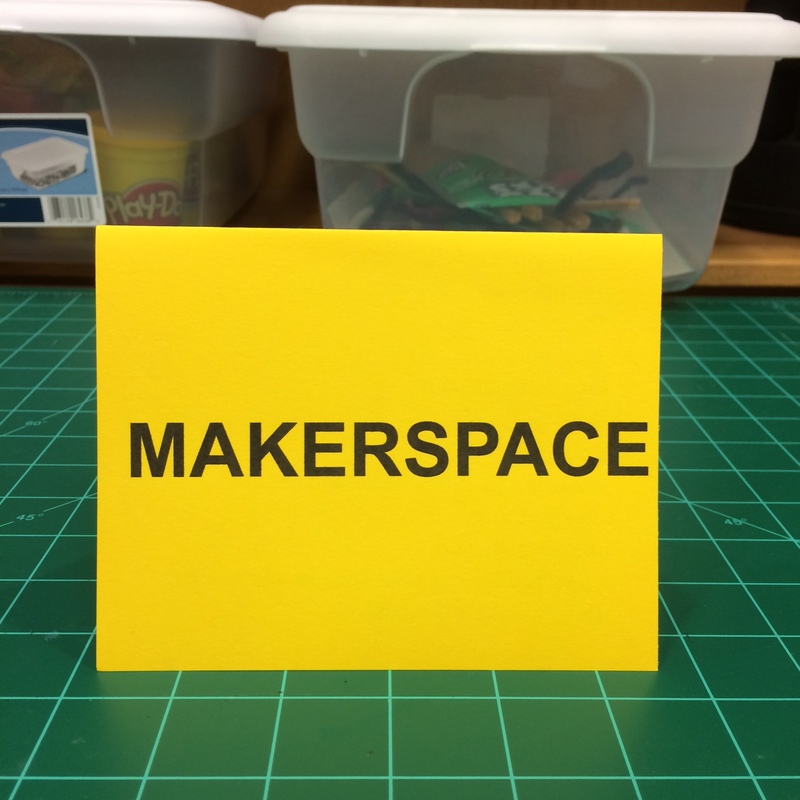 Teachers and librarians often tell me that they are thinking about creating a makerspace. I leave these conversations wishing that I could help with the hardest part, getting started. In fact, one of my earliest blog posts was encouraging teachers to simply start MAKING in the classroom. The Makerspace Starter Kit is my solution. Deluxe version of the Makerspace Starter Kit that includes designs for laser cutting and 3D printing a Makerspace sign is at http://www.thingiverse.com/thing:297759. The Makerspace Starter Kit follows the model of the folk tale Stone Soup. In the story of Stone Soup, a traveler wanders into a village and places a stone and water into a pot and places it over a fire. He loudly declares to the suspicious villagers that he is making a wonderful soup that all are free to share. He tastes the soup and says it is almost ready and only needs a little something to make it perfect. In time, each of the villagers contributes to the soup and everyone including the traveler partake in a delicious meal. The Makerspace Starter Kit is the stone. It is a focal point for your declaration that this is a MAKERSPACE. It is your job to convince the members of your community that making will feed the spirit of kids, that kids can and should learn by making. 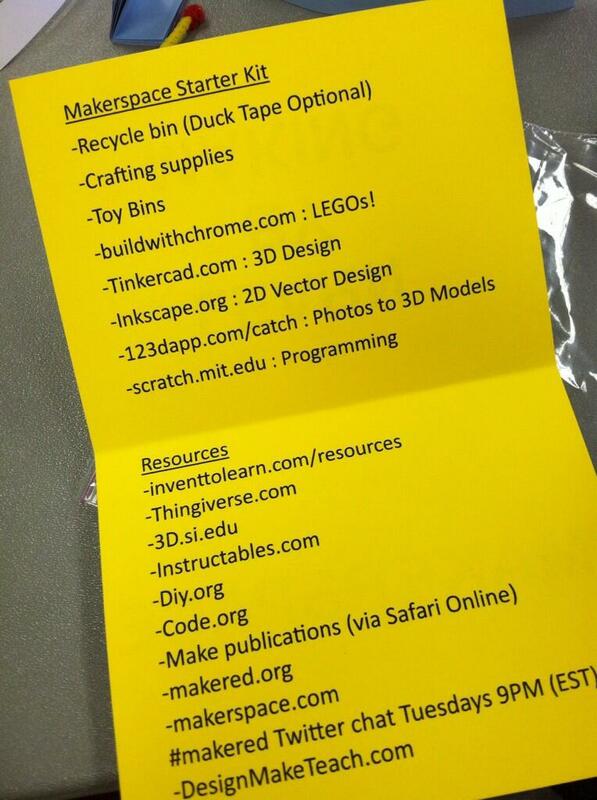 The global maker village has already contributed many free resources for your makerspace. Your local village has the ingredients to grow your makerspace. Enjoy. Please leave suggestion in the comments or contact me on Twitter @DesignMakeTeach. I would love to see photos of the Makerspace Starter kit in the wild. I cannot open the MakerSpace Starter Kit PDF. I’m getting a WordPress 404 error-file not found. If you still can’t get the file then I can e-mail it to you. At this point, I’ve given out about 100 kits during workshops, 200 kits at ISTE 2014, and around 300 downloads. I’ve talked with a handful of people that have shared their Makerspace Starter kit stories. Mainly they are folks that were already on the path to creating a makerspace but the kit has inspired them to share with others. Hoping to hear more great stories from the many kits given out at ISTE.